Founded in September 1991, Laserdyne Pty Ltd is an Australian engineering and manufacturing company specializing in electro-optic products for military, paramilitary and similar applications in demanding environments. Laserdyne designs, develops and manufactures its own products, and operates a quality management system to the ISO9001 standard. The company supplies Standard and High Definition Flat Panel Displays, Video Recorders, and Laser Rangefinders to its international client base including military, law enforcement and similar customers. Black Opal increases the effectiveness of surveillance, sighting and security systems. 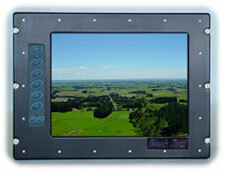 Engineered for land, sea and air-borne display applications, Black Opal ruggedized displays include remote/indirect viewing of video images generated by day and night and by thermal cameras. Each model has an LCD monitor with a tough, low reflection, high clarity window providing EMI/EMC shielding. The microprocessor unit, power and control electronics are housed in a rugged enclosure with heating and cooling mechanisms. Model sizes vary and all are button operated.